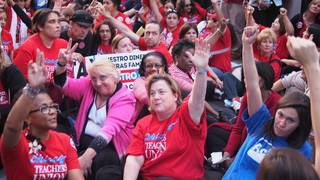 Striking Teachers, Parents Join Forces to Oppose “Corporate” Education Model in Chicago | Democracy Now! has taught science for the last nine years. He currently teaches at North-Grand High School in Chicago. He is a strike captain at his school. Cantor is also part of the group Teachers for Social Justice. mother of two public school students in Chicago and a member of the grassroots group, Parents 4 Teachers. Her kids attend Coonley Elementary School. AMY GOODMAN: In a moment, we’ll be joined by Professor Pauline Lipman, but first we go to two other guests in Chicago: Phil Cantor, teacher at North-Grand High School, he’s a strike captain at his school and part of the group Teachers for Social Justice, and Rhoda Rae Gutierrez, the mother of two public school students in Chicago, a member of the grassroots group Parents 4 Teachers. We welcome you both to Democracy Now! Phil, why don’t we go to you first? The strike has just been announced. Explain what this is all about, in the nation’s third-largest school district. PHIL CANTOR: We’re striking for a lot of reasons. If you just see what’s in the mainstream media, all they talk about is that teachers want more money. But that’s really far from the truth. We’re fighting for reasonable class sizes. We’re fighting for wraparound services for our students. I teach in a school with a thousand students; we don’t even have one social worker in that building for most of those kids. So we’re fighting for the education our students deserve in Chicago. We’re fighting against reforms that we see, from the classroom level, are not going to work. AMY GOODMAN: Explain why the emphasis on salary then. Is that the legal issue of what allows you to strike? PHIL CANTOR: That’s absolutely right. You know, Rahm Emanuel has pushed through laws in Illinois, basically designed for his political gain, in my opinion. We’re not allowed legally to strike over anything but compensation. But teachers are not most interested in compensation; we’re most interested in being able to do our jobs for the students we serve. So, you know, I think we’re trying to tie other issues that we feel are very important to compensation, so they’re part of the bargaining table agreement. AMY GOODMAN: Rhoda Rae Gutierrez, you’re the mother of two students and member of Parents 4 Teachers. Where do your kids go to school? How old are they? And what are you doing today on this day of a strike? RHODA RAE GUTIERREZ: Hi, Amy. Thanks for having us. So, my kids are at Coonley Elementary School here in Chicago on the Northwest Side. My youngest is a kindergartner, and my oldest is a second grader. What we’re doing today is, actually, we’re joining the teachers on the strike line, and we’re showing our support for the call for a fair contract, because what we know and what we believe in is that the working conditions of teachers are the learning conditions of our children. And when we fight for the rights of teachers for a fair contract, fair compensation, lower class size, well-resourced schools—and we mean having psychologists, enough social workers, enough support staff, enough aides in the classroom, nurses. This is what we’re fighting for. And when teachers have these resources in their schools, we know that our children can do incredible things. AMY GOODMAN: Now, the issue of high-stakes testing, how does it affect the students, Rhoda? RHODA RAE GUTIERREZ: Well, so last night we watched Rahm Emanuel on his—Mayor Emanuel on the—at his press conference, and I was incredibly disappointed. I was disappointed because he said that one of the things that he’s going to measure teachers on is essentially test scores. And what I know as a parent is that when teachers are measured in terms of their performance because of test scores, what happens is that teachers are forced to teach to the test, and they have to narrow the curriculum on very—on very, like, minor skills that are taught—that are tested on these standardized tests. And so, he calls for a rich curriculum, and yet he calls for, what he says, merit pay, but what it is is test-based pay. And that is not a rich curriculum. It is narrowing the curriculum. And it was incredibly disappointing to me when he said that at the press conference yesterday. AMY GOODMAN: Phil Cantor, explain what high-stakes testing means for teachers and what it means when your pay is related to that. PHIL CANTOR: At my school, I looked at the calendar for the year, and there are about 15 days where students are being tested on standardized tests. These tests are not designed to help the students. Many of these tests are designed because of No Child Left Behind to measure the school. And now, because of Race to the Top and these new reforms, now these tests are being used to measure teacher performance. So, what does that mean? It means that rather than planning rich-inquiry, interesting lessons for our students, we have to focus on very specific tested standards in a very narrow way that students have to then demonstrate those skills. To give an absurd example, this week I’m supposed to give a district-mandated test to my ninth grade biology students, who I’ve known for one week, on DNA-to-RNA transcription and translation in protein synthesis. The reason they’re getting this test, on material they’ve never seen before, is so that I can be measured from the beginning of the year to the end of the year. It is putting our students in a terrible position to do something that was never—it’s an insane way to try to measure teachers. It’s clearly sort of the business model, the corporate model of people who don’t understand the classroom, saying, “Oh, we’ll test them at the beginning of the year and the end of the year and see growth.” But it’s an absurd sort of test that is not going to work even for that purpose, and it’s certainly not going to help our students. AMY GOODMAN: And the issue of charter schools, how does that play in here, Phil? PHIL CANTOR: Charter schools are being used to privatize the school system. There’s research that shows that charter schools actually tend to be used as a tool of gentrification in the city. The threat is that if we don’t do well on standardized tests, then our school will be turned around, meaning it will be turned over to a private charter school operation. So there’s this constant threat over teachers that if you don’t get test scores up, your school will be privatized into a charter, you’ll lose your job, your community will lose a community-based school, and students will have to sort of lottery to get into your school. What I see at the school at the neighborhood school level—where I work is a neighborhood school—I see the best students of my neighborhood sort of getting pulled out toward the charters, because their parents have the impression that they’re better. And then, when the charter struggles with a student with behavioral difficulties or learning disabilities or language disabilities, that kid ends up getting pushed out of that charter, and then I see them at my school. AMY GOODMAN: And the level of unionization of teachers in the charter schools? PHIL CANTOR: Most of the charters are not unionized at all. AMY GOODMAN: I want to thank you both for being with us. We’re going to continue the conversation after break with Professor Lipman. Rhoda Rae Gutierrez, mother of two students, will be out on the picket lines with her kids today. Phil Cantor, teacher and strike captain at North-Grand High School, member of Teachers for Social Justice. This is Democracy Now! We’re talking about the teacher strike today, first time in a quarter of a century teachers striking the third-largest school district in this country, in Chicago. Stay with us.